Legacy is a sense that someone’s life will have enormous tangible and intangible impact that will transcend time across generations. It’s hard to know if people are aware of the impact they may or may not have had on other people. Celebrations of a life often come, when impactful people cannot join the joint honour that beneficiaries of their remarkable existence display in their name. 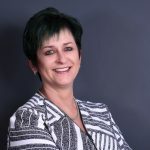 Berenice Le Grange will be fortunate enough to witness a celebration in honour of the years she has devoted to growing, influencing, exposing, up – skilling, inspiring, mentoring, coaching and loving the people around her. Her influence on the quality of education and performing arts in her community and the entertainment industry at large is a generational footprint that will outlive many of us. Her multiple titles run parallel and her work is reflected in scores of success stories in both the creative and academic sectors. The 65 – year old, Kimberley born mother of three, has devoted decades of her life to the church as an organist whilst establishing many firsts for entertainment and opportunities in her community and Johannesburg. The Eldos Arts and Jazz Festival stage has paired local talent with international sensations. The incident free jazz festival is an annual home to scores of creative and international visitors, and has seen over twenty thousand people in attendance on its best performing days over its ten – year lifespan. This project on its own has exposed and equipped youth in key skills needed in the events, hospitality and entertainment industries. It has also become a symbol of everything that is right with underdeveloped communities like Eldorado Park, that are reeling from social ills, a lack of exposure to opportunity and economic exclusion. At the same time, Aunty Bee, as she is affectionately known, has groomed artists through her music schools and arts centres that have produced the country’s finest performers. She was doing this while also being part of Pro Artes Populi, which has put children from all backgrounds in Eldorado Park on stage with the Johannesburg Festival Orchestra for the past twenty years. These massive community choirs joined pupils from several primary schools with arts majors from various institutions and classical music veteran musicians to host one of the most phenomenal displays of talent and exposure within the community. Renowned conductor Richard Kock has been an invaluable ally to the consistency and success of the Pro Artes Populi annual concert. Her retirement this year will undoubtedly leave a void in Heerengracht Primary School where she was the Senior Phase Mathematics and Natural Science teacher. Many learners learned to read music while playing the recorder through her extra mural activities. She has served on various committees that have ensured the success of the annual school programme. There are many learners from difficult backgrounds who will never know what it is like to be adopted by Aunty Bee for the school holidays, they will also never feel or see her impact again. She has been a sanctuary for both troubled and gifted children, and planted seeds that have produced resilient and respectful citizens. She managed her daughter, Bianca’s rise to stardom and ensured that she was armed with the qualities and longevity fit for a shallow and cut throat industry. Despite Bianca’s popularity and decades of relevance in entertainment, Aunty Bee still remains the most famous and loved of us all. Aunty Bee is currently part of the Greater Eldorado Park Orchestra, where once again she is training and mentoring the youth in and around Eldorado Park. One of her dreams are to see the orchestra grow into a national institution bringing together as many youth as possible. It would be a great loss if her legacy fails to influence and inspire future generations of community vanguards like herself. It is against this incredible background that Aunty be will be honored at a star studded line up of incredible artists like Dr. Victor & The Rasta Rebels, Sipho Hotstix Mabusa, Loyiso Bala, Jason Goliath, Bianca Le Grange, Reggie Philanda and many many other amazing artists who are coming together to celebrate this phenomenal Woman. 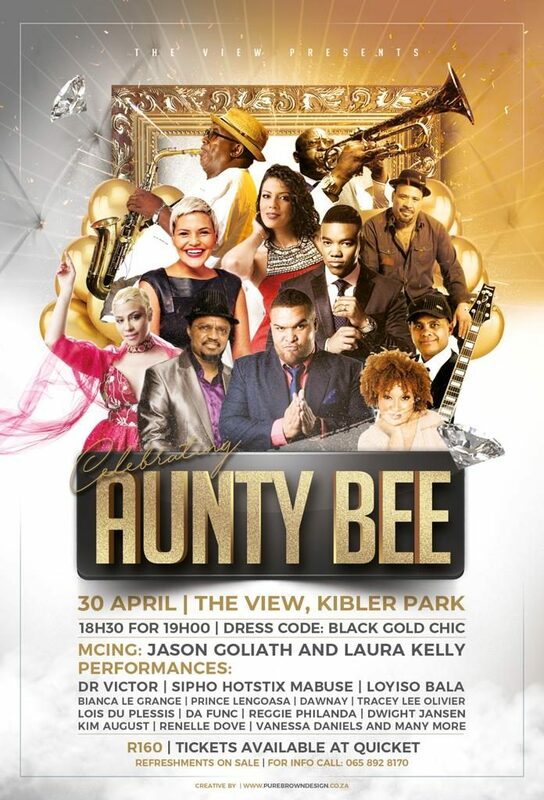 The Tribube concert will take place on Saturday, 30 April 2019, at The View in Kibler Park and promises to be an incredible experience.